Greenhouse Megastore Junior Series Teaching Package - Finally, a commercial quality greenhouse at a price that will not break your budget. Don't let the price fool you; the frame of this structure is constructed from the same high quality, galvanized steel roll-formed components as our larger greenhouses. As such, this building can be engineered to meet almost any snow or wind load rating. The 6mm twinwall polycarbonate covering offers an R-Factor of 1.55 which is only 0.02 less than 8mm coverings and comes with the same 10 year warranty. For these reasons and more, this "Junior" Series package is one of our most popular and will offer performance and reliability for generations of students. Complete frame with 6mm polycarbonate twin-wall covering. (1) 3' x 6'-8" Plyco insulated door. (2) J & D Motorized Inlet Shutters. (1) 2 Stage Cooling Stat. (1) Modine HD75 High Efficiency Gas Unit Heater (Natural Gas or Propane). (2) Horizontal Air Flow Fans. Complete assembly instructions, and an electrical wiring diagram showing details of all equipment connections. Roof vent(s) are optional and can be ordered separately. All Garden Grower Hobby Greenhouses are engineered to meet 70 mph wind and 10 pound live load per the UBC Building Code. Even higher load ratings and stamped engineered plans are available at extra cost. All galvanized steel frame insures maximum strength and life. Lexan twin-wall polycarbonate covering is UV resistant and carries a 10 year warranty against discoloration. The Garden Grower uses the same steel components as utilized in our commercial structures. A combination of (1) and (2). 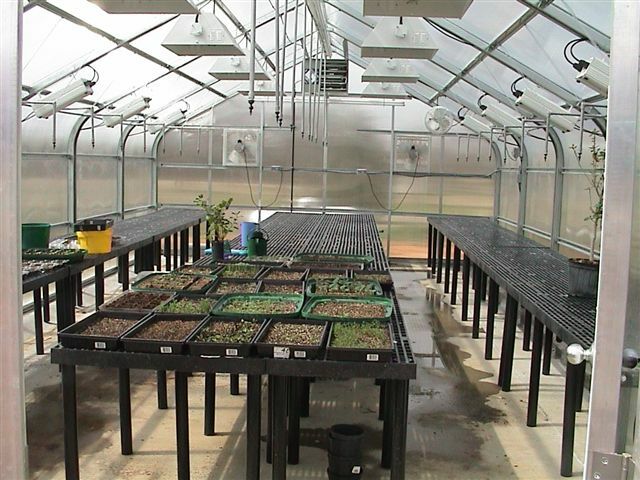 Greenhouse Megastore can begin the project by setting the column posts and your students, boosters, or contractor can complete the rest of the structure with Greenhouse Megastore supervision. For information on how best to plan your greenhouse assembly and construction prices, call our Sales Representatives toll-free at 1-888-281-9337. Additional accessories including evaporative coolers, benches, grow lights, shade cloth and irrigation systems have been designed to fit perfectly with the Garden Grower Greenhouse. Normal shipping time is 2 to 3 weeks after receipt of order. Please allow additional time for transit from factory. 50% of basic greenhouse price will be charged upon receipt of order. The balance will be charged when shipment is made. Greenhouse Megastore works with HFS Financial and QuickSpark to provide financing to homeowners and businesses.